by Chris Woodford. Last updated: December 15, 2018. Tick tock, tick tock—that's the sound we think of when we think of clocks, even though the vast majority of modern timekeepers make hardly any sound at all. Not so long ago, virtually every clock and watch made a tick-tock noise because it was completely mechanical rather than electrical or electronic. Instead of your clock being powered by a battery, you wound it up with a key and there was a long swinging rod inside, called a pendulum, that made sure the whirring gears kept good time. So how did these old-fashioned pendulum clocks actually work? Let's take a closer look! Photo: A compact, wall-mounted pendulum clock. 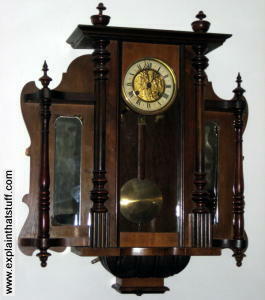 On clocks like this, the swinging pendulum is very much a feature; in grandfather clocks, the pendulum is often discreetly hidden behind a door (see below). Here, l is the length of the pendulum and g is a measure of gravity's strength (what we call the acceleration due to gravity). You can see from this equation that you need to quadruple the length of a pendulum to double the time it takes to make a swing. A pendulum works by converting energy back and forth, a bit like a rollercoaster ride. When the bob is highest (furthest from the ground), it has maximum stored energy (potential energy). As it accelerates down toward its lowest point (its midpoint, nearest the ground), this potential energy is converted into kinetic energy (energy of movement) and then, as the bob climbs up again, back to potential energy. So as the bob swings (oscillates) back and forth, it repeatedly switches its energy back and forth between potential and kinetic. Something that works this way is called a harmonic oscillator and its movement is an example of simple harmonic motion, though we won't go into those things here. Artwork: A pendulum is constantly swapping potential energy and kinetic energy. If there were no friction or drag (air resistance), a pendulum would keep on moving forever. In reality, each swing sees friction and drag steal a bit more energy from the pendulum and it gradually comes to a halt. But even as it slows down, it keeps time. It doesn't climb as far, but it covers the shorter distance more slowly—so it actually takes exactly the same time to swing. This handy ability (technically called isochronism, which just means "equal amounts of time") is what makes a pendulum so useful for timekeeping. How does a pendulum clock work? Suppose you want to build a clock from scratch in the simplest way possible with the fewest number of parts. You could start with a dial and some hands and move them around the face with your finger, counting seconds to yourself and moving the hands accordingly. You move the second hand once a second, the minute hand once every 60 seconds, and the hour hand once every 60 minutes (3600 seconds). Some clock! That's going to get tedious quite quickly, so what about automating things? You could mount the hands on a little axle driven by what we'll call "timekeeping gears," so that the second hand automatically turns the minute hand at 1/60 of its speed, and the minute hand, likewise, turns the hour hand at 1/60 of its speed. Then all you have to do is count seconds, turn the second hand, and the rest of the job is done for you. But, hang on, that's still pretty tedious. What we really need is some way of powering the hands automatically. You could wrap a piece of string around the axle and attach a weight to it. As the weight falls, it will pull the axle around, turn the second hand, and that will drive the rest of the clock. The only trouble is, the weight is going to fall really quickly and the second hand will whizz around too fast so the clock won't keep time. 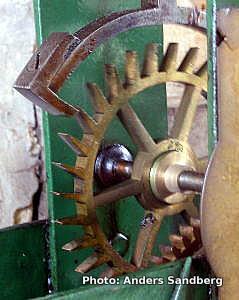 Okay, let's introduce another set of gears—we'll call them "power gears" (to avoid confusing them with the timekeeping gears)—that will take power from the falling weight and transform it so that, as the weight falls, the second hand advances exactly one position on the dial in one second. But that still won't work because the weight is going to accelerate as it goes down, like any falling object. In other words, the clock is going to get faster and faster until the weight hits the ground with a smack! What we need to add is a mechanism that regulates how fast the weight can fall, allowing the whole timekeeping mechanism to advance so the second hand moves one second on the dial (and only one second) in a time of one second. That's what the pendulum does. As it swings from side to side, it rocks a lever called an escapement that locks and then unlocks the part of the mechanism driven by the falling weight. (Think of it this way: the mechanism is locked and the escapement releases it so it can move—in other words, lets it escape—once per second.) It's this repeated locking and unlocking that makes the tick-tock sound you can hear. Since (in theory, at least) a pendulum of a certain length always takes the same amount of time to swing back and forth, the pendulum is what keeps the clock to time. The escapement mechanism that the pendulum regulates also (cleverly) keeps it moving back and forth by repeatedly giving it a slight nudge—an extra injection of energy to counteract friction and drag. That's not exactly how pendulum clocks work; it's a very simplified approximation of what's going on that's reasonably easy to follow. Photo: The escapement is a rocking lever that allows the gears in a clock to advance only at a certain rate, determined by the swings of the pendulum. Photo by Anders Sandberg published on Flickr in 2009 under a Creative Commons Licence. Animation: How the escapement works: 1) The falling weight powers the clock. 2) As it drops, the weight pulls the gears around. Left to its own devices, the weight would accelerate, falling faster and faster. 3) The rocking escapement engages and disengages the gears, so they turn at a constant rate, and the clock tells accurate time. 4) The swinging pendulum rocks the escapement and sets the rate at which it moves. A dial and hands that indicate the time. A weight that stores (potential) energy and releases it to the clock mechanism as it falls, very gradually, over the course of a day (or several days, if you're lucky). Winding the clock raises the weight back up, storing more potential energy to power the mechanism. A set of timekeeping gears that drive the different hands around the clockface at different speeds. These are usually finer and more precisely made than the power gears. A pendulum and escapement that regulate the speed of the clock and keep it (more or less) constant. In practice, clocks have lots of other bits, pieces, parts, and features that horologists (master clockmakers) like to refer to—with splendid honesty—as "complications." Photo: 1) When most people think of a pendulum clock, this is what they picture in their mind: a grandfather clock (also called a longcase clock). 2) Clocks like this have a long pendulum that makes only a relatively narrow sweep back and forth. 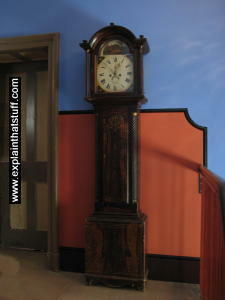 3) Grandfather clocks often have very ornate and beautifully painted dials. 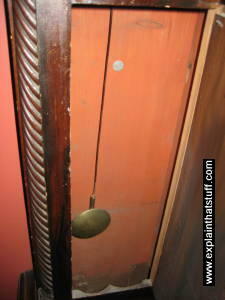 Photo: One of the most accurate pendulum clocks ever made before better technologies made them obsolete. This was the official US timekeeping standard from 1904 until 1929. It was made by Clemens Riefler in Germany. Photo by courtesy of National Institute of Standards and Technology, Gaithersburg, MD 20899. Can you see any problems with pendulum clocks? Me too! A pendulum of a certain length takes the same amount of time to move back and forth if the strength of gravity stays the same. But what if the length of the pendulum changes? That could certainly happen if it's a metal pendulum and the room temperature goes up or down (say, between winter and summer), because metals expand in the heat and contract in the cold. Now what about gravity? We treat it as though it were a constant, but the strength with which Earth's gravitational force pulls on objects varies across the surface of our planet: it's greatest the closer you are to the center of Earth, so it gets slightly less as you climb mountains and slightly more as you get closer to sea level. That means the same pendulum clock will keep different times in New York City and Colorado, for example! And talking of sea, imagine taking a pendulum clock on a ship. What's all the pitching and rolling of the waves going to do to the neat back and forth movements of your pendulum? Not going to work very well, is it? The first of these problems—the slightly changing length of the pendulum—is relatively easy to fix. We simply use compensating pendulums that automatically adjust ("compensate") as the temperature changes. Two early kinds were mercury pendulums (incorporating glass tubes full of liquid mercury) and gridiron pendulums (made by using two different metals, such as steel and copper, zinc and steel, or steel and brass, that cancel out one another's expansions and contractions). At the start of the 20th century, people started making pendulums from a new material called invar (an alloy of nickel and steel), which expanded very little with temperature changes and virtually solved the problem. Clockwork mechanisms: Toys and gadgets were once commonly powered by windup mechanisms inspired by the workings of clocks. Gears: How wheels can transform speed or force in a machine. Quartz clocks and watches: Modern timepieces use vibrating quartz crystals instead of swinging pendulums. Here's how they work. Springs: These spirals of metal are perfect for storing energy. The Story of Time: Find out about the history of timekeeping with Britain's National Maritime Museum. John Harrison and the Longitude problem: Find out how a very persistent, 18th-century clockmaker developed chronometers (super-accurate clocks) that worked at sea (another excellent page from Britain's National Maritime Museum). Longitude by Dava Sobel. Walker, 1995. A short but very readable account of John Harrison's successful quest to develop accurate clocks for navigation at sea. The Pendulum: Scientific, Historical, Philosophical and Educational Perspectives by Michael R. Matthews et al (eds). Springer, 2005. Examines the fundamental importance of the pendulum in many aspects of science and society. The Pendulum: A Case Study in Physics by Gregory L. Baker and James A. Blackburn. Oxford University Press, 2009. Another volume that goes beyond the basic science of pendulums to consider their wider importance in society. Clockmaker John Harrison vindicated 250 years after 'absurd' claims by Danielle Venton. The Guardian, April 19, 2015. 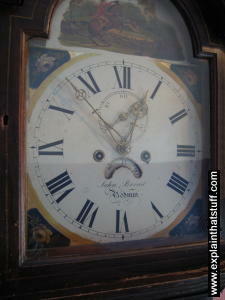 One of John Harrison'ss clocks is declared the most accurate pendulum clock in the world. Introducing the World's Most Precise Clock by Jérôme Lodewyck. IEEE Spectrum, September 30, 2014. Scientists develop a clock that will lose one second every 13.8 billion years. Engineering the 10 000-Year Clock by David Kushner. IEEE Spectrum, October 27, 2011. Why the world's most precise pendulum clock will tick only once every ten seconds. The Essence of Time: Monumentally Important Clocks by Danielle Venton. Wired, June 23, 2011. From Stonehenge to atomic clocks, an interesting review of "milestone" timepieces through history.